This is my own little random number generator, home sick from preschool with a tummy ache brought on by too much Valentine's Day candy I think. So I wrote everybody's name down on slips of paper and let her pull one out. Linda you are my Valentine's Day winner (picked two days late of course, when am I ever on time...sigh someday) Also someday I fully plan to wear makeup to go grocery shopping instead of baseball caps and jeans, and also to have a clean backseat in my car with no crumbs/snacks/toys/or crayons stuffed in the cracks. Someday. Anyways congratulations Linda! Email me with your address and I will try and get it in the mail by this weekend. 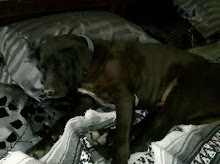 Forgive me for taking fuzzy over-exposed pics with my cell phone again. I was just excited to share my quicky finish. It is Bent Creek's "Are you my Mother?" 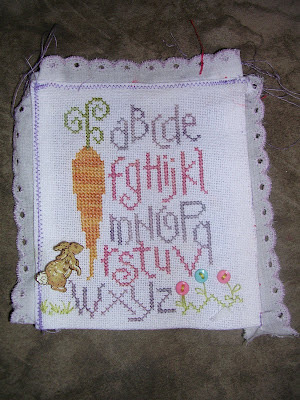 I thought it was so cute, and it only took me about 4 hours of stitching to finish it. I am trying to get a bunch of spring-ish ornaments done to hang up in time for Easter. I found the cutest white shelf at Goodwill for $6 bucks, and it has a towel rack underneath of it that I want to fill with ornaments (who needs towels!) Anyways I changed all the colors on this one of course. 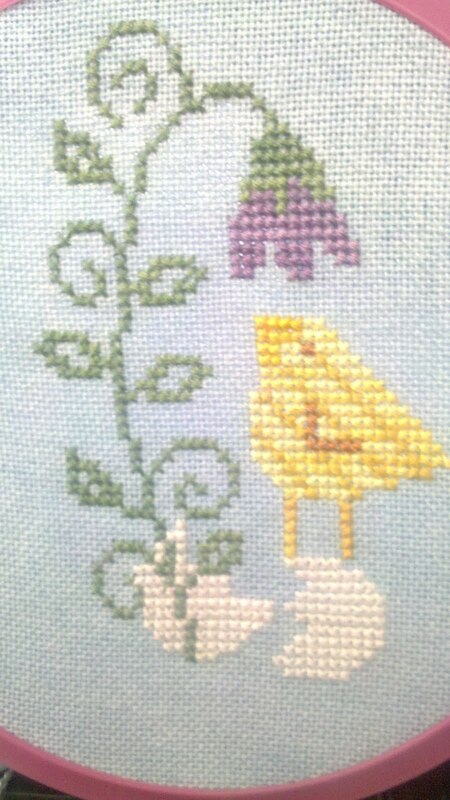 In case you wanna know, I used Crescent "Purple Aster" & "Magnolia Blossom" Gentle Art "Shutter Green" & Gentle Art "Nutmeg" and Weeks "Sally's Sunshine" with "Curry" for the stripes on the little chick. And this is my progress on "Lord's Blessing", I am really enjoying this one and have been neglecting all my other Crazy January projects. I think I am just going to have to get this done before I pick up one of my other bigger pieces. Well actually its on my back porch! 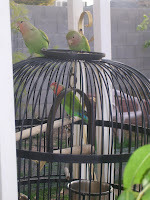 In the form of a flock of wild love birds that love to come and visit my tame lovebird Kiwi-wi. So I thought ala Garden Grumbles, who always has such cool nature pictures on her blog, I would snap a few of my own. 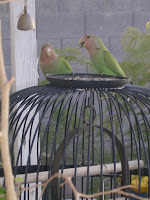 Surprisingly the wild lovebirds let me get almost within arms reach of them to snap these photos. 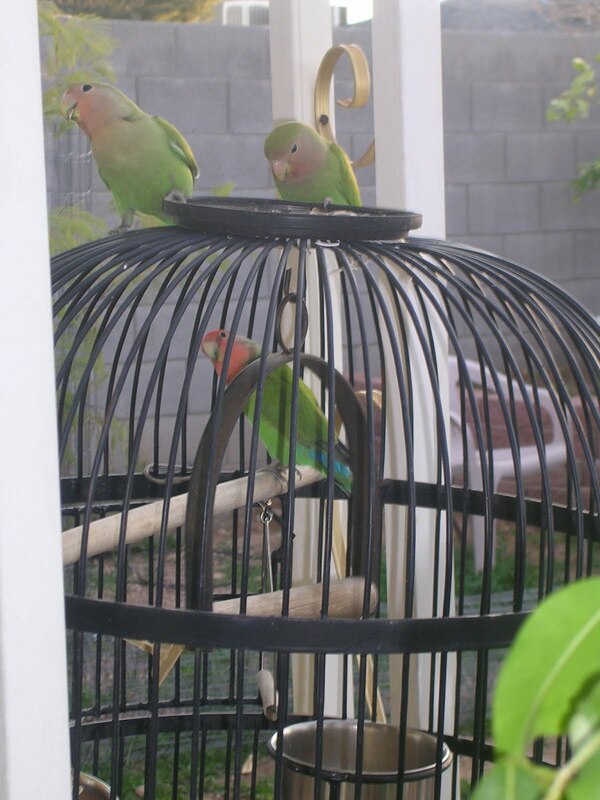 These birds originated in West Africa, which is why they are able to survive here in our warm climate with mild winters (it's been in the seventies the past two weeks here, beautiful weather! 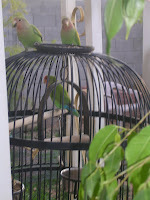 )Kiwi-wi though only goes outside when the afternoons are warmer, she has an inside cage too. 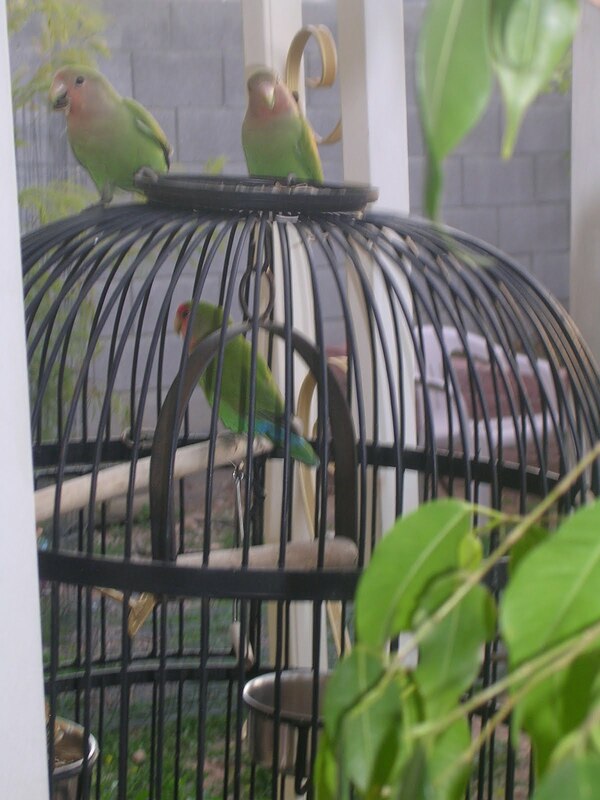 As soon as I put her out in her porch cage she starts calling loudly to her wild friends, and within a few minutes these two are on top of her cage. 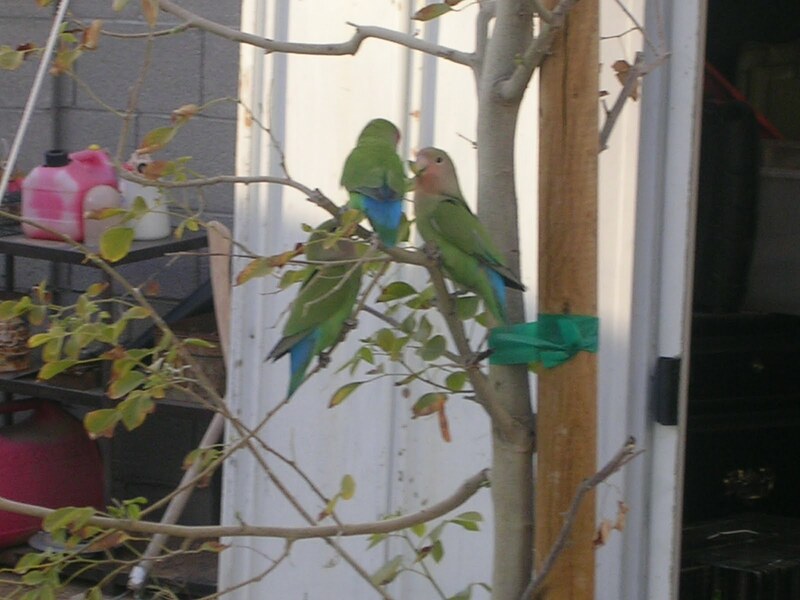 There is actually a flock of about thirty birds or so that live in our neighborhood, but I think it is the same two that come to visit her each day. 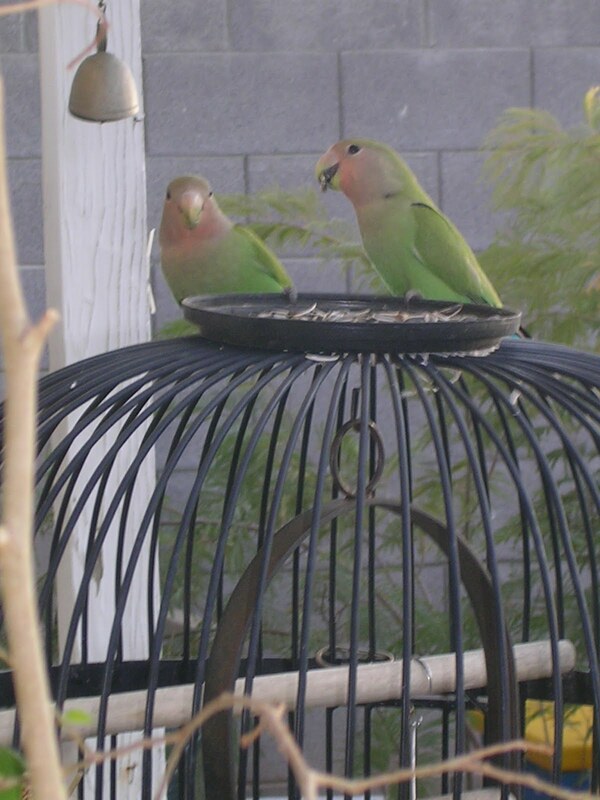 I put a dish of sunflower seeds on top too as a treat for them. 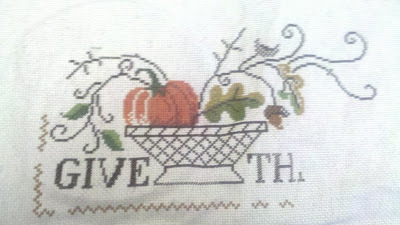 This is my progress on Diane Arthurs "Give Thanks", it's stitching up pretty quick. 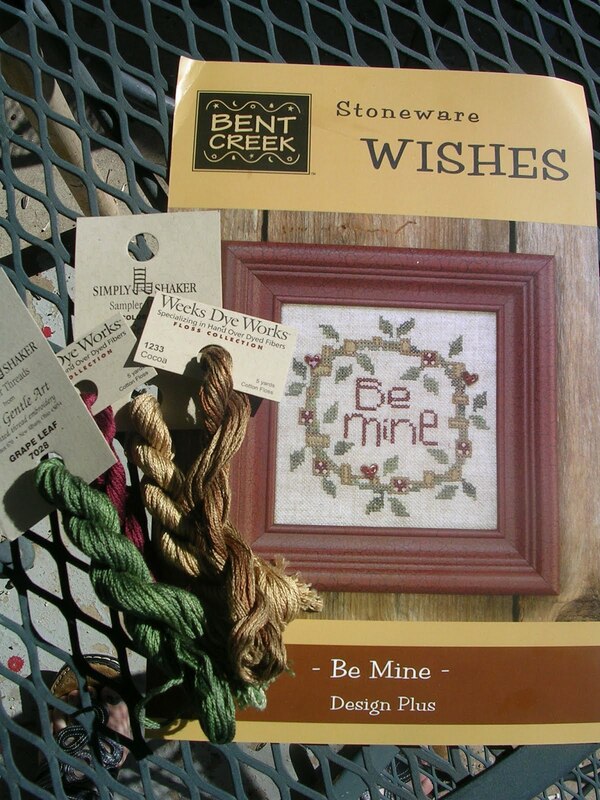 Though my fingers are itching to pick up another spring project. 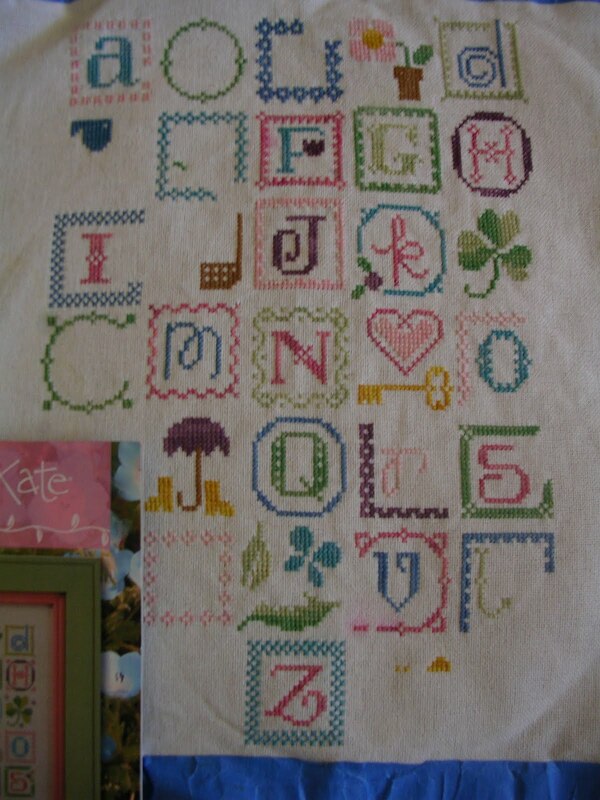 I have not been brave enough yet though to attempt finishing Lizzie Kate's "Spring Alphabet" again, i'm not sure i'm up for the frustration! So it is still sitting in a Ziploc baggy with all the pretty eyelet trim. Would it be wrong to just hang up the Ziploc bag as my way of displaying it? And now something exciting. I wanted to do a little Valentines giveaway. 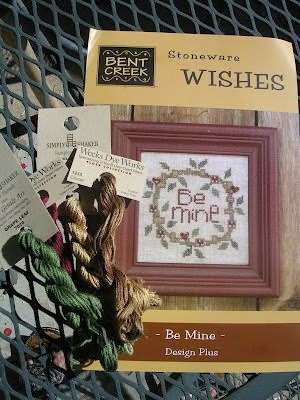 So here is Bent Creek's Stoneware wishes "Be Mine". I did the "Peace be With You" one last year and loved it. 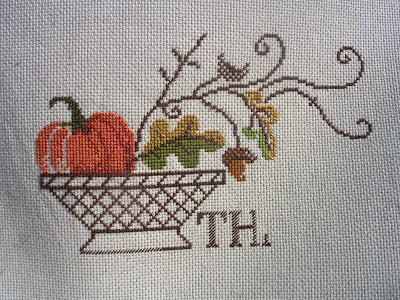 I am including all the threads needed to finish it and some little heart buttons from my stash (the chart I ordered didn't come with Bent Creek's buttons.) To enter my giveaway just leave a comment! I will pick a winner on Valentines Day. 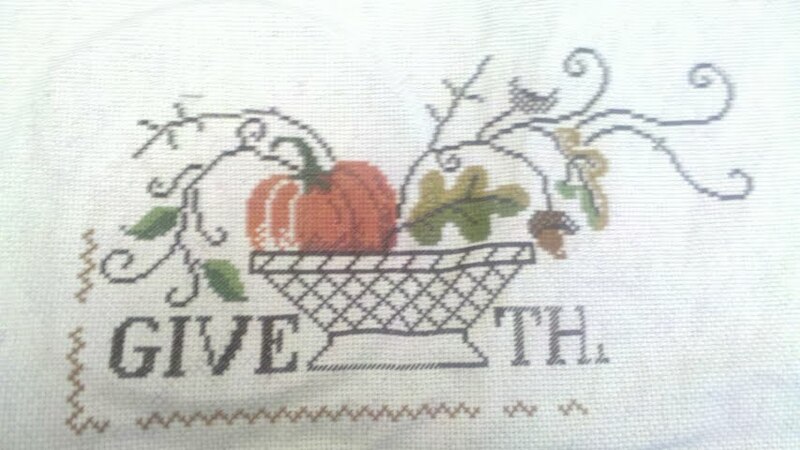 Somewhere out there my 7th grade home-ec teacher is laughing at me. You see in 7th grade home-ec short-sighted me never imagined I would want or need to know how to sew eyelet trim onto a pillow. In 7th grade the only thing I remember caring about was 7th grade boys and when school would be over with and whether I liked my outfit that day. 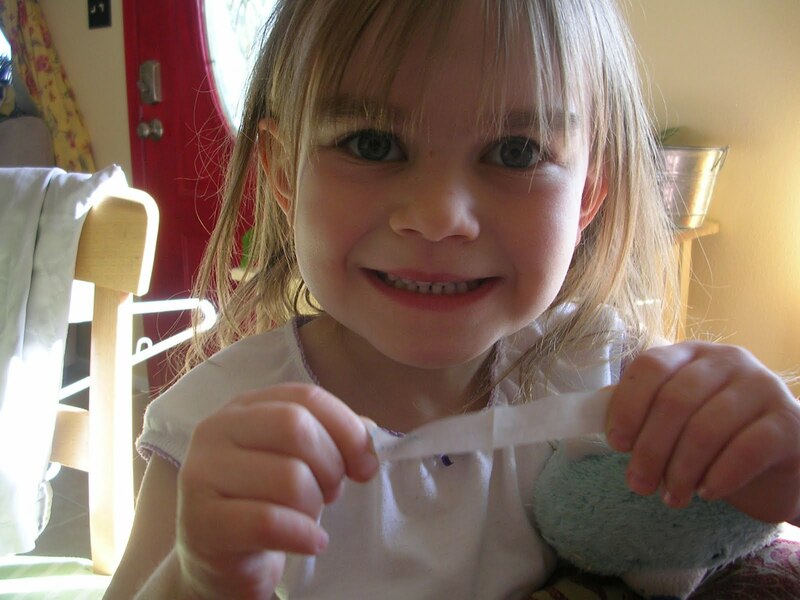 In 7th grade I laughed at girls who sewed their own clothes or did anything crafty. Now I wish I had paid attention when we were learning how to sew pillows. It probably would have saved me about 2 hours of frustration last night! So after multiple attempts to sew the trim on correctly I finally gave up and stuffed it all away in a bag, and cleaned up all the thread I had ripped out over and over from this little pillow.On a happier note I did find a cute little bunny button at Hobby Lobby, and am quite happy with the little bunny gazing wistfully up at my giant carrot. 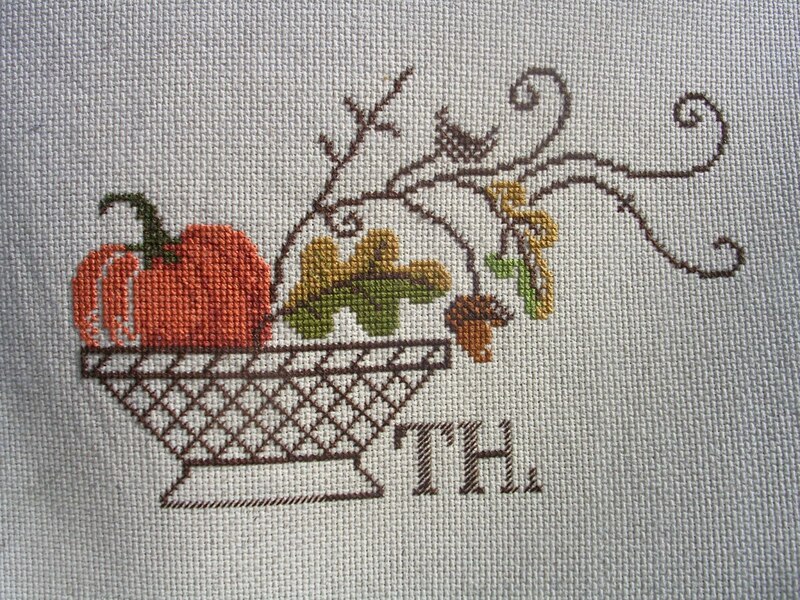 And this is my 15th project of the challenge. 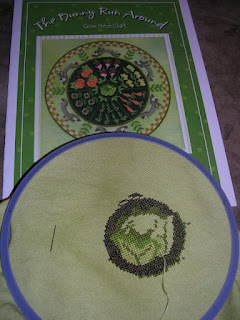 I originally thought I would be organized and stitch in a very strict order days 1-15 and then start over at day 1. I have quickly realized that is not how it is going to go. I can't do organized, but I can do whims. 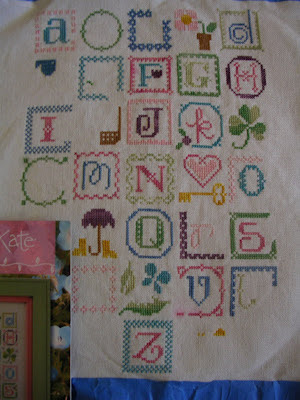 So each morning I peruse my stitching basket of all 15 projects and pull out whichever one calls to me. I like this one, it is definately top 5. Of course I may be biased towards anything with bunnys. I re-dyed the fabric on this three times! 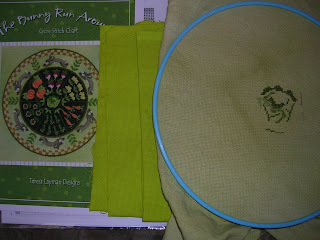 I originally started with Chartreuse (pic on the right) which looked spring green on the cover of the dye box but turned out BRIGHT green on the actually fabric. 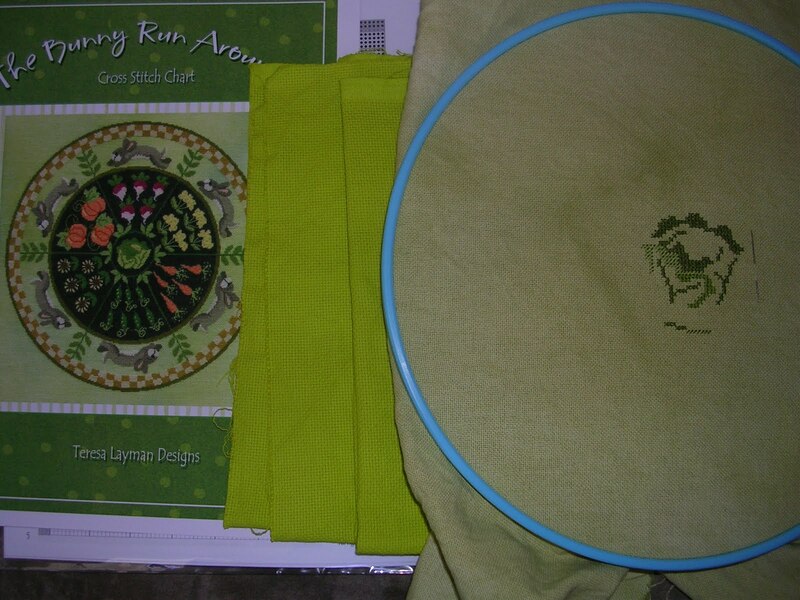 So that piece got tucked away in my linen box, it might work for a later halloween project instead.